My husband and I just got back from our third trip to Poland. This was our second time spent on the farm my dad was born on and continues to be overwhelmingly meaningful. Most evenings, if not all, were spent around a table sharing a meal, discussing life (through translation via their two, wonderful daughters, Anita and Ola) and singing favorite Polish songs out loud. Of course, Ed and I either hummed, “la-la-la’d” or simply took it all in, smiling from ear to ear. As each evening progressed into the night, the songs became more laid back, emotional and free-flowing with less inhibition from everyone. For sure, my cousin Henia’s homemade plum wine (from their 2000+ plum trees) helped our voices to sound, um…shall we say better? We were, after all, still getting to know one another. It was all very healing and grounding. It’s hard to put to words. I plan to make a CD of the songs we sang together to share with my Polish relatives. but I think watching the videos is even more fun. I hope you agree. One of the first evenings included Krzys’s, parents from down the road, Adam and Johanna. Adam will be 90 soon and Johanna is 85. Krzys is Henia’s husband. Adam was a playmate of my dad’s before the war. Our visit with Adam and Johanna on our first visit five years ago was one of our favorite days and this year’s visit with them proved to be one of my husband and I’s favorite days as well. Both participated in the singing throughout the evening with Johanna becoming more and more animated as the songs continued. There were a few she basically led, being the only one who remembered all the words, a “call and response” so to speak. As many of you with European decent might already know, hand motions are very important in communicating—even more so when you’re leading in song! Johanna became our “DJ” at times, as Anita (the eldest daughter) pointed out with a chuckle. It was heart-warming to say the least. Another evening, we again went down the road to Krysia and Czesiek’s house for dinner and song. Krysia and Henia are sisters. As mentioned earlier, the songs flowed more easily as the night progressed. Okay, so there was vodka at this house, but that’s beside the point. Swaying (to song! ), hand-holding, and much laughing accented each verse. I brought a paper copy of a 2009 email I’d saved from one of our initial connections with Anita, who found us on Facebook over nine years ago. It contained the names of relatives along with pertinent details, including the account of how my dad’s sister, Stasia, had passed away. Stasia is Henia and Krysia’s mom. Anita was moved to read this email out loud to the others that evening, in Polish of course. We were all wiping our tears away and hugging by the end of the reading. This honoring of history—of our elders, the telling and retelling of stories—does not happen enough here in the U.S. The last song we sang as a family, was by special request of Ed and I. We requested they sing the Polish anthem, the song that made my dad cry whenever he heard it and the song Ed and I went down the aisle to. I still can’t listen to this song without crying. When I was a child, my dad shared many stories. He did a walk-about through various areas of Poland once before World War II. He believed that you could tell the emotional state of each area by the songs they sang and the energy with which they sang them. So this tradition of singing with family and friends is part of their culture—our family’s culture. It’s in our DNA. Perhaps this is why it felt so very right. Our connections have grown stronger with each song and story. We will hold these memories in our hearts forever. Who is your safe place to vent or talk about what’s bothering you? Choose those friends wisely so you feel safe when sharing. This keeps the doors open for honest communication vs. just the niceties you think everyone wants to hear. And then hold on to THAT friend. I wasn’t always able to speak what was on my mind without constant filtering growing up in a PTSD-ridden household. I spent most of my childhood never speaking up because I was too busy trying to stay clear of the volatility in our family conversations. I’m well-versed in holding my tongue when necessary, but I also allow myself to express my opinion a whole lot more than when I was younger. I think I’m making up for lost time now. You see, my environment has changed. I treasure those friends that love and care about me, as I am in any given moment, and listen. How about you? My husband is my absolute best friend. He’ll let me rant when I need to because he knows me, I mean really knows me. So he listens. And he respects who I am and where I’ve come from enough to know that sometimes it’s best just to let me say what I need to say to get it out. Getting it out is healing. He understands that he’s the only one I share everything with and he honors that relationship. Being able to speak my thoughts without filtering is healing. He is healing. Are you that someone for your friends? My mind/body training as a yoga instructor and yoga therapist has had a huge influence on the state of my well-being and resiliency to stress. I no longer spin out of control with worry or upset like I did many years ago. But there are those occasions. On the occasion that I’m really upset and my husband knows I’m ramping up, he’s the only one that can pull me back to center with a gentle nudge and a deep caring. There are no digs or insults in our relationship save the joke or two that we know are joking. My words are safe in his presence and his words are safe in mine. There is no armor to shield our energy. The walls are down. It’s an unfiltered relationship. Or perhaps, maybe in retrospect, it’s so naturally filtered that we just don’t let the bad stuff through. Either way, we know we are in a safety zone when speaking. I’ve heard that when someone loves you, the way they say your name is different. You just know that your name is safe in their mouth. Do you have a friend in your life that you feel safe sharing with—that unfiltered relationship with the shields down? Treasure them. Hold them close. Revel in it. They are so far and few between. The longer I know my husband the more in awe I am of him, the man that he is and what our relationship means to me. There’s a depth that’s palpable. It’s a friendship unfiltered. I shudder to think where I’d be emotionally without his huge heart surrounding my world. So here’s to all those out there who will let their loved ones speak without a filter—those who will be the healing balm of “listening and responding with respect” for the person standing before them; and who will say your name differently because it’s safe in their mouth. My mom lost her mom to pneumonia when she was only 13 and was auctioned off as a prisoner of war to a German farmer during WWII when she was only 18. She never saw her family again after the war. My parents met in a displaced persons camp and immigrated to the U.S. on March 11, 1950—68 years ago. My mom’s dad died in 1968 after she’d already been in the U.S. for eighteen years, trying to make a life for her growing family of five children. She received a letter from her step-mom bearing the news of her dad’s passing. I remember she cried all day. Several years later she purchased a set of statues depicting an elderly couple. The grandfatherly figure of the pair was a shoemaker busily making shoes as the grandmotherly figure peeled potatoes. She shared that the statues reminded her of her parents—in particular, the shoemaker because my grandfather was a shoemaker. I was in my early teens when she purchased the statues and I grew to treasure them. I’d never met any of my grandparents nor were there any photos of them that I’d ever seen. So this was my only tactile piece to “remember” them by. This my mother knew. I mentioned my admiration for them often. My mom passed away at 62 in 1987 with stomach cancer that spread to her lungs—which we didn’t know until the autopsy, but that’s for another story. My dad moved from the house they last shared into another one not too far away for a few years, and then he decided to move to Florida (from Indiana) permanently in the early 1990s. Just prior to moving, he got the idea from one of my older sisters to auction off his household belongings so he wouldn’t have to move them all; and he could start fresh in Florida. My sister had done something similar a few years prior with her possessions. It brought in some good money and helped clear the slate without a lot of hassle clearing out old stuff. That appealed to dad. Not wanting to keep any extra cash from my dad, when he asked us to pick out what we wanted from the family house, I only chose a few precious pieces—some mugs I’d bought mom and dad with Polish endearments on them, a few nick knacks including a bright red candle base I thought I’d use for Christmas, and the elderly couple statue set. Two grocery bags contained the items I chose. My husband and I lived five hours away in Madison, WI at the time. We were expecting his sister and boyfriend up for a visit the following weekend. So when we got home with our bags filled with memories, I put them aside to prepare our house for company. It was a day or so into his sister’s visit when I had a brief moment and decided to pull out the statues and rinse off the dust in the kitchen sink. As I turned them over I saw my mom’s handwriting in ink on the bottom of the statues. She wrote fluently in Polish and spoke fluently in English, but she wrote phonetically in English. There on the bottom of each of the statues was written: “To Sandy ‘Lov’ Mom 1979”. I burst into tears. I had no idea she had earmarked them this way for me. Needless to say, they are now one of my most prized possessions—a message from mom written to me eight years before she passed. You never know when you’ll hear from your loved ones. You may not know what messages they’re trying to send. Turn over your statues. In 2008, my husband and I visited Poland—the homeland of our ancestors—for the first time. I was having some issues with my left hip prior, but the pain was off the charts when we landed. The pain in my left hip wouldn’t allow me to walk more than half a block at a time without doing a “last resort” lunge wherever I could to alleviate the pain a little so I could walk another half a block. We had not rented a car so travel by foot was our only option within the various cities we were visiting. It was still a beautiful trip with unforgettable, precious moments. I refused to let the pain dull the time there or the memories. We had an absolute blast visiting many of the top tourist spots like Krakow, Zakopane, and Częstochowa; as well as the larger cities near my parent’s birthplace villages: Kielce and Rzeszów. We were not in touch with Polish relatives at that time. So our visit did not include family. More than one person shared their belief that the pain in my hip was a reflection of ancestral healing needed within either my family or even my homeland, Poland. We carry the stories of our ancestors within our energy field. Unresolved conflicts, emotional wounds, damaging judgments, and other limitations held by your ancestors past or present will continue to influence generations to follow. Our ancestor’s memories lie within our DNA. Deep, unexpressed emotions such as grief, anger, guilt, shame and fear can also be passed to us from our ancestors, just like our eye and hair color. Energy from our ancestors passes through the family tree. It’s an amazing thought, isn’t it? When friends and therapists shared the concept of ancestral healing and connected it to the pain in my hip, I have to say I was more than a little intrigued. As a yoga teacher, I’d learned that we store a lot of emotions in our hips, especially the emotions we don’t want to, or can’t, deal with. Your hips generate any movement forward in your life. If you’re feeling stuck or blocked in some way, your hips are usually involved. The idea that an ancestral block was lodged in my hip resonated with me—especially since the pain went off the charts once we landed in Poland. My Polish ancestors definitely had deep, unexpressed grief. Undeniably, negative influences from the past affect us mentally, emotionally, and spiritually; and as we’ve learned from mind/body science, they also affect us physically and energetically. Since the hips are where every initiative starts, any pain or trauma we have stored in the hips that’s stopping us from physically moving forward will also stop us from energetically moving forward. Perhaps visiting Poland without connecting with family on our first visit stopped my hip from moving forward with ease on our trip. Perhaps my ancestral homeland was “holding on” to my every step insisting I do more than just visit the tourist stops. Who can say? “Emerging trends in psychotherapy are now beginning to point beyond the traumas of the individual to include traumatic events in the family and social history as part of the whole picture. Tragedies varying in type and intensity—such as abandonment, suicide, and war, or the early death of a child, parent, or sibling—can send shock waves of distress cascading from one generation to the next. 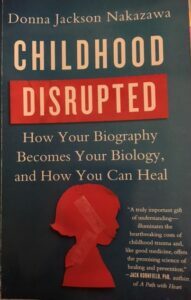 Recent developments in the field of cellular biology, neuroscience, epigenetics, and developmental psychology underscore the importance of exploring at least three generations of family history in order to understand the mechanism behind patterns of trauma and suffering that repeat.” ~ Wolynn, Mark. 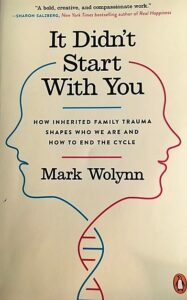 It Didn’t Start With You: How Inherited Family Trauma Shapes Who We Are And How To End The Cycle. New York: Penguin Books, 2017. My ancestors were immersed in traumatic events. Poland’s geography placed them in the middle of fighting powers resulting in much destruction, tragic losses and World Wars. Even knowing very little about my history, and after having only written of my grandmother’s lives thus far, their history includes loss of a mother, father, husbands, children, and a suicide attempt. Both of my parents were prisoners of war. This makes sense, doesn’t it? Research shows the rational part of a teens brain isn’t fully developed until they’re 25. If traumatic events affecting your immune function, nervous system, and physiology are occurring while your brain is still forming, how can it not affect the brain? The environment within which we form affects the results of our genetic make-up. It affects how we react in the world, how we parent, how we work, how we make friends, how we love, and how we age. It even affects the threshold of when we respond to stressful events. “In other words, when a child is young and his brain is still developing, if he’s repeatedly thrust into a state of fight or flight, this chronic stress state causes these small, chemical markers to disable the genes that regulate the stress response—preventing the brain from properly regulating its response for the rest of his life. ….early chronic stress biologically reprograms how we will react to stressful events for our entire lives. That long-term change creates a new physiological set point for how actively our endocrine and immune function will churn out a damaging cocktail of stress neurochemicals that barrage our bodies and cells when we’re thirty, forty, fifty, and beyond. Once the stress system is damaged, we overrespond to stress and our ability to recover naturally from that reactive response mode is impaired. We’re always responding.” Nakazawa, Donna Jackson. Childhood Disrupted. How Your Biography Becomes Your Biology, and How You Can Heal. New York: Atria Paperback, 2015. We all know what stress does to the body long term, right? It creates inflammation in the body and we are literally “…marinating in those inflammatory chemicals for decades.” It’s no wonder diseases such as autoimmune disease, irritable bowel syndrome, fibromyalgia, chronic fatigue, heart disease, migraines, cancer, and many others are the result. Having an adult in your childhood that you trusted, who “had your back”, and who listened when you needed to talk helps to buffer adverse childhood experiences. These relationships help to build your resilience factor. Other ways to increase your resilience include staying positive and hopeful, having goals you set and move towards, fostering connections within your circle of family and friends, and accepting change as a fact of life. Taking care of your health by exercising regularly, eating a nourishing diet, reducing stress through mindfulness, meditation and yoga, and making time for fun are ways you can improve your brain’s neuroplasticity. We can all do this. This is why I teach trauma-informed yoga. This is why I incorporate Ayurveda (the science of life and self- healing) into my life and my teachings. It has been through my trainings that I discovered some of the answers to my physiology—why I worry so much, why I may have developed an auto-immune disease, and why I feel so much better after yoga and meditation. We teach what we need to learn, don’t we? This I do for me. You can too. Do more yoga. Agnes, or “Agnieszka” as known in Polish, is my paternal grandmother. I will try to piece together what I know about Agnieszka and attempt to put myself in her shoes as I did for my maternal grandmother, Zofia. Amazingly in a collection of old black and white photos my parents had was a photo of what I had labeled “unknown family in Europe.” Our second visit to Poland in 2013, this time to visit family, undoubtedly confirmed the photo to be of my grandparents and two of my dad’s siblings—his younger brother, Vincenty (or Vincent); and his sister, Stanislawa. I now knew how my grandparents looked! How do you describe the emotion of seeing your grandparent’s faces for the first time in 52 years? My parents never went through the black and white photo collection they had saved from the “old country” with us. I just assumed it was all people from the displaced person’s camp; and as you recall, as a child I didn’t touch the sleeping dragon by asking too many questions. Once I knew how my grandparents looked, imagine my delight in finding what I believed was a second photo of my grandmother! The original is a family photo with my grandmother, grandfather, their daughter and a son. The second photo I found appears to be an earlier photo of Agnieszka sitting on the grass with the same two small children and another young lady who looks like she may be peeling potatoes. This young lady peeling potatoes could very well be my grandaunt (some refer to this relationship as “great aunt”). Although I don’t even know for sure if my grandmother had a sister. I know the Basa family (my grandmother, Agnieszka’s maiden name) lived down the road from the Bronicki family (my maiden name). And a family visit seems likely, right? It is within an easy walking distance. I know from our trip to Poland in 2013. It was somehow comforting to discover the Basa family still lives in that house to this day, and my grandmother’s daughter’s daughter—my cousin’s family—still live on the farmland my dad was born on. Next door to the Basa family is another cousin. Within 10-20 minutes are more cousins and distant cousins. My roots run indelibly deep in my homeland. I don’t know a lot about Agnieszka prior to her early twenties. She lost her father sometime between 1914 and 1918, during World War I. She would have been between 20 and 24. He died from typhus, a disease often associated with wars and natural disasters. Remember, Poland didn’t exist on the map during World War I, but its geographical position between the fighting powers (Germany and Russia) meant much of the fighting occurred there resulting in overwhelming death and destruction. It’s estimated over three million Poles were made to enlist in the armed forces by the occupying powers while another approximate 300,000 were taken as forced labor into Germany. I’m not sure which of the two happened to my great grandfather. Famine and disease caused further civilian losses. His grave is not in the family gravesite because his body was never sent back to the village. He died at “at points unknown”. I don’t know the year my grandmother, Agnieszka Basa, married my grandfather, Jan Bronicki. Even though I’m in touch with the relatives still living in the village and on my dad’s home farm, they also do not know. I only know Agnieszka had her first child—my dad—when she was 28 in 1922. Jan was 32. It’s my assumption they were married not too long prior to that because marriage and family went hand in hand. Remember from 1796 until 1919, Poland did not exist as a county. World War I ended in 1918. In 1922, it had only been four years since World War I had ended after much destruction to their land and less than three years since Poland’s independence had been confirmed June 1919 thru the Treaty of Versailles. There had been border fights fought between 1918 and 1921. Poland was finally “settled” in 1922. My maternal grandmother Zofia was 37 and marrying her second husband the same year my paternal grandmother Agnieszka, 28, was having her first child. 1922 was a time of new beginnings. Agnieszka and Jan had four children. There were three boys and a girl in order: Michal (my dad) in 1922, a couple of years after that Jozef in 1924, Vincenty, the last boy, came approximately two years after that; and Stanislawa was born in 1928. I wonder if they planned it that way, approximately two years apart for each child. It seems so well organized, so on purpose. I’m not sure why my dad and his next oldest brother, Jozef, were not in the photos. Perhaps they were in school. I have to believe that photography back then was not cheap and the opportunity to have a photo taken was not an everyday event. But I also know the Poles were (and still are!) strict about things like education and responsibility. So pulling your children out of school for a photo was probably not even a consideration. My dad was in the fourth grade, around nine years old, when he went to live with his dad’s older sister during the school year to go to a better school. He continued there through the sixth or seventh grade. Given the sibling’s ages, dad would still have been living at home when either photo was taken. The school in his home town had two grades in one room and alternated every hour: quiet/homework and “loud teacher instruction”, as my dad worded it. My dad could memorize just by one reading and was getting straight A’s by 4th grade. So I’m thinking they decided a better school would be more challenging for him. He told me he almost wasn’t accepted at the new school but passed the entrance test. History and geography were his best subjects. Now back to the photos! As you may have noticed in your old family photos from that era, most did not smile. My grandmother is smiling in both photos which I find so endearing! I’ve had the two photos sitting on my laptop the past few weeks to inspire my writing. As a result, she’s been on my mind a lot. We’ve become great friends in my mind’s eye. Having her photo has made it easy to imagine I knew her. She seems so approachable and, I must add, absolutely gorgeous! I would have liked to have known this beautiful lady. The smile on her face in these two precious photos does not betray the trials she endured in her life thus far. There was more hardship to come. Germany invaded Poland September 1, the Soviets on September 17, 1939. After heavy artillery fire and much destruction, Poland’s capital city, Warsaw, surrendered to the Germans on September 27, my dad’s 17th birthday. Warsaw is only about three hours away from my dad’s village. Hitler intended to erase the Polish nation and “Germanise” the territory. The Soviets likewise were intent on “intellectual genocide.” Poland was again partitioned—Germans on the west, the Soviet Union on the east. Mass arrests, exile and executions followed. They estimate that between one and two million Poles were sent to Siberia, the Soviet Arctic and Kazakhstan in 1939–40. I’m sure my grandparent’s village was gripped by fear—another World War in their homeland. Within the year, Jan passed away in my dad’s arms. My dad told me he was the only one in the room with his dad when he passed away. Jan was 50. If I have the timing right on their marriage, Agnieszka and Jan were married only 18 years. Within the following year, my dad was taken in the middle of the night by the Germans as a prisoner of war—thrown into a truck with other boys from the area to be delivered to German farms for forced labor. Whenever the Germans came through their village again Agnieiszka took her remaining family of three children and hid in the forest. My cousin’s daughter, Agnieszka’s great granddaughter, recalls Stanislawa telling the story that they ate from the field at night, finding a potato or two. So it was cooler outside. One of my yoga students is also from Poland. Her parents remained in their house when the German’s came through and demanded they vacate. Of course, they resisted. Because of their resistance, they were sent to the concentration camps. I would expect that word of the Germans approaching your village and knowledge of what resistance could bring, prompted the survival instinct to hide in the forest. I can’t begin to imagine the fear my grandmother had without a husband to rely on and after having lost her oldest to the Germans as she hid her family in the forest. Upon returning to the farm, the German tank tracks were visible near their home, some chickens missing, the house disheveled. When we visited my dad’s family in 2013, my cousin’s daughter, Anita took us for a walk in the nearby forest that surely my dad had frequented with his brothers and sister. The smoothed out hollows in the earth where the Polish villagers would hide from the Germans were still apparent this many years later. It was an eerie, surreal feeling to walk through the forest. On the one hand my dad probably spent some wonderful hours playing within the forest area; but on the other hand, the energy of villagers in wait and in fear lingered. World War II ended in in 1945. Agnieszka passed away in 1955. She was 61. I’ve been gazing upon my grandmother’s lovely smile these past few weeks, and I have imagined she and I would have been close had I been privileged enough to know her. Her smile has touched my heart. When I close my eyes, her image enters my mind. She lives in my made-up memory of what might have been. She would have been 66 the year I was born. Had she lived to a ripe old age, there would have been plenty of time to spend together creating the grandmotherly bond we were never to share. Yet, I still talk to her as though she can hear me because I believe she can. This I know for sure. Souls never die. Family bonds are forever. “My parents were prisoners of war on German farms (forced labor) during WWII. My dad was taken from his home when he was 17, my mom was auctioned off to a German farmer. After the war, they met in a displaced persons camp in Germany—still basically prisoners—got married in that war camp, and had two children in that war camp. Most don’t know about this part of WWII history. Displaced persons were unwilling to return to their country of origin. The way my dad told it, there were regular attempts to trick them into signing papers saying they were willing to become communist and return to Poland. Both of my parents have passed away. My mom in 1987 (see my previous post) and my dad in 2003. Information on my mom’s history is sketchier than my dad’s since I have been in contact with my dad’s side in Poland. Yesterday I started to piece information together about my grandmother on my mom’s side. I’m almost 57 years old and for the first time I am trying to understand my maternal grandmother’s history. I have no photographs of either of my maternal grandparents. I only have some notes. I remember one Sunday afternoon in 1986 my mom and I were sitting at the kitchen table during one of my visits. She started to talk about her family in Poland. I forget if I asked a question or if she started the conversation. Either way, I remembered thinking I should write what I could down. So I grabbed the quickest notepad I could find. I knew this was a rare moment and I knew better than to get too inquisitive for fear of shutting her down. She didn’t like to talk about “the old country” too often. Remember earlier when I said you didn’t touch the sleeping dragon? There was a line in the sand you didn’t cross, questions you didn’t broach. As I look back at those notes, I kick myself now for not getting more specific details. But that was a long time ago. I’m much older now…and much braver. My mom’s been gone over 30 years now. I’m almost as old as she was when she passed away. Her history may have passed away with her as I’m not in touch with her side of the family. I spent yesterday researching the timeframe of my grandmother’s life. What was going on around her? I tried to put myself in her shoes. My mom was born June 14, 1924 in Rzeszow, Poland. Her mother was Zofia (Sofia). This was Zofia’s second marriage. Zofia’s first husband froze to death while in the U.S. for his job. I don’t know the details of why he was in the U.S. Sadly, I don’t even have his name—first or last. I don’t even know my grandmother’s first married name. Gaps in my history like this sadden me to no end. Zofia had three children in her first marriage. The first two children were twins, Simon and Mary, and they died when they were “about three”. I often wonder why I didn’t ask more. How did they die? Why was Zofia’s first husband in the U.S.? How did he freeze to death? Salka (Sally), Zofia’s third child, survived and was mom’s half-sister. Salka was nine when Zofia remarried for a second time to Jan (John), my grandfather in 1922. Zofia was 13 years older than Jan. She was 37, he was 24. If Salka was nine when Zofia remarried, Zofia would have had a one year old when World War I (1914 – 1918) broke out. I don’t know the year her first two children passed away. I don’t know when her first husband left for the U.S. or even how long he was there. But I have to believe travel was either very limited or banned once World War I started. So I suspect her first husband was not in Poland at the start of the war given how tumultuous Poland was as a result of the war. I don’t see him leaving his family right after, but this is only a presumption on my part. I only know Zofia married my maternal grandfather in 1922. Zofia had two children with my maternal grandfather, John. Emilia (Emily) was born in 1922 and my mom, Paulina (Pauline), was born in 1924. Rzeszow, the area where my mom’s family lived, was hit hard during World War I with three armies fighting across their land. From 1796 until 1919, Poland did not exist as a county. In 1922, it had only been four years since World War I had ended after much destruction to their land and less than three years since Poland’s independence had been confirmed June 1919 thru the Treaty of Versailles. There had been border fights fought between 1918 and 1921. Poland was finally “settled” in 1922. Suffice to say, Zofia lived a hard life. Losing your husband overseas and having a family to raise on your own would be difficult by any stretch of the imagination; but given the political environment in which she lived, I can’t imagine how she was able to pull herself together. As I tried to put myself in my grandmother’s shoes for the first time to this extent, I felt like I was literally “creating” my grandmother’s memory. Zofia passed away from pneumonia when she was 52, only 15 years after she was married to Jan. My mom was just 13. It was August 25, 1937. Grandmothers treasure their grandchildren. I dwelled on the lost moments, lost memories. I even pondered what she might think of me, her grandchild. I looked so much like my mom, I wondered—do I resemble my grandmother, Zofia? I was overwhelmed with emotion. My heart was heavy and my head swimming with all the research when it was time to stop for the day. My husband and I have a standing “date” to go out on Friday’s to our favorite restaurant, Buona Sera. On the short drive over to the restaurant, I read to my husband what I had cobbled together on my grandmother’s history; and I verbally beat myself up over asking these questions so many years too late. Almost immediately, as he often does, Raffaele looked to his left, grabbed a lovely bottle of wine and handed it to us saying “this is what you’ll have with your dinner”. He knows us well. My heart stopped as I glanced down at the bottle of red wine in my hand—the label read “Sofia”. Tears formed as I processed the full weight of the message from my ancestor. I believe everything’s a message. I believe if you are open to signs, you’ll receive them. I believe our souls never die and they watch over us always. And I believe my grandmother was sending me an acknowledgement of thanks for my efforts yesterday. I will hold this memory close in my heart forever. Thank you, Raffaele, for being my grandmother’s messenger. 30 years ago today my mom passed away. It’s hard to grasp just how long it’s been. It seems impossible. I can still remember how she used to say my name with her Polish accent—both when she was happy with me (Sandy) and when she wasn’t (Sandra!). Some days I worry I’ll forget. I’ve held April 11 close in my heart. This day has always been personal, safely guarded from anyone but my closest family and friends. I’ve chosen to celebrate life vs. death anniversaries. Yet and still, it’s impossible not to acknowledge when April 11 comes around each year. It’s impossible not to remember. There’s a silent nod, a spiritual awareness of the sacredness of her passing and the effect it had on my life. I remember thinking the “11” was like an opening with borders left to right, a doorway of sorts, a gateway to heaven perhaps. The two numeral “ones” just stand there stark and cold. At least that’s how it seemed 30 years ago. I wondered how the world could simply go on, how we could all just go on. It felt like the world should stop somehow, for a moment at least, to pay honor to this soul that had passed. The usual ceremonies (the wake, the funeral, the gathering of close friends and family, the burial) weren’t enough closure for me at the time. I’m not sure anything at that time would have felt like closure. It was so raw for so long. An open wound that wouldn’t heal. I spent the week after the funeral with my dad trying to put their house in order and prepare him for taking care of all the details mom used to do. No matter how many notes I wrote, and taped instructions I adhered to appliances, I knew it would be a rough road for him. I called him daily for a long time just to let him cry. You see, while they had many fights in their lifetime, they had a common history—both were born in Poland and both were prisoners of war in Germany during World War II. They met in a displaced person’s camp after the war. I know their experiences in Germany resulted in post-traumatic stress (PTS) and I know their many fights were rooted in PTS. Deep down I also knew they both loved each other. It always surfaced when the other needed it most, like right before mom died. None of us knew mom had cancer until the autopsy. She went into the hospital with pneumonia and was released a week or so later, but she wasn’t getting better. She wasn’t eating well. A standard blood test showed something major was wrong and she was rushed back into the hospital not too long after she was released. I received a panicked call from my sister-in-law that I should come home right away on the same Saturday my husband and I were expecting his parents and brother to arrive at our home. It was a five hour drive from their farm in Indiana to Wisconsin where we lived. Cell phones weren’t common back then. We had no way of reaching them. We waited for them to arrive only to immediately jump in the car and drive the same five hours back to my mom. I found out my mom had passed away from the attending nurse when I called from a phone booth on the way home to Indiana. While no one was able to really say “goodbye” because no one knew she was about to die, I struggled with not making it home before she passed for years. It still bothers me. This year’s anniversary seems more poignant than most. My step-mom, Prudy, passed away last Thursday. She met and married my dad several years after my mom had passed—somewhere around 1994 or 1995. They were married less than ten years with the last few being really rough on Prudy as my dad developed Alzheimer’s. He passed away in 2003, the year my husband and I lost both of our dads. She was a source of great comfort for my dad and a huge blessing in all of our lives. My husband and I became quite close to Prudy over the last 20+ years. She was a dear, sweet, adorable, fun, wise and trusted friend. It’s a different kind of relationship with a step-mom, especially when you’re already an adult when you first meet. There’s none of the drama in your history. She filled our lives with much joy and we so enjoyed all of our visits and long talks. I think I was lulled into believing she would live much longer than her 91 years. Maybe all these years I’ve kept the anniversary of my mom’s passing personal and close to my heart because I didn’t want to re-visit the open wound. Maybe I was afraid to stir up the emotions, believing the memory wasn’t as raw as it once was because I just didn’t go there; or perhaps couldn’t go there. They say sometimes you don’t feel the full blow until you’re ready to handle it. This year’s anniversary of my mom’s passing is still personal—still held close to my heart. But this year I’m feeling it so much deeper because I couldn’t help but “go there” this year. This year April 11 came on the heels of another loss. My guard was down. This year it’s shared with the loss of my very last mom and I can’t contain my emotions. My first mom passed in 1987 when I was just 27. My second mom (in-law) passed away April 30, 2015. April has taken all of my moms and I can’t help but feel like I’ve lost my last anchor. I’m so very lucky to have had three moms and I am oh so grateful to have had each and every one of them in my life. God must have known I’d need extra. Their memories will serve as my anchor now. I will always remember. I had the honor and absolute privilege of giving my mom (in-law’s) eulogy on May 4, 2015. She was 92. I loved mom dearly. We all did. Part of this came from a blog I wrote for Prana Pages a few years ago, and the ending presented itself to me as written just before mom passed. Dad had passed in 2003. He was a few days shy of 96. Our matriarch has passed. Since I’ve been a part of the Krzyzanowski family, I’ve personally considered mom a living saint. There has never been a doubt in my mind. Over the years, literally every picture of mom and dad showed her head lying lovingly on his shoulder. We all knew how much they adored each other. Shortly after his death, she woke up hearing the sound of someone singing. Thinking it was a radio left on; she searched for it in the house, only to find nothing that could be the source of the beautiful song. I should add she was very hard of hearing and did not have her hearing aids in at the time. The next night, the same thing happened. Suddenly she realized the voice was Dad singing to her sweetly sometimes in Polish, sometimes in English. 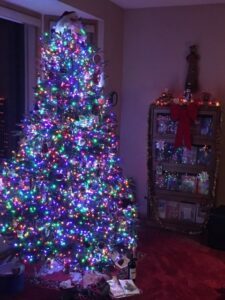 His songs were timely—wishing her happy birthday at the appropriate time, and Merry Christmas when the season rolled around. He often referred to her by the Polish nickname he had for her– Yädˈvēshä. Dad was not necessarily known to sing, which adds to the wonder and mystery; but singing is so much more romantic, isn’t it? This gift amazingly continued the rest of her days with Dad’s songs coming between sleep and awake. Once when she visited us in Minneapolis, she was cat-napping on the couch and suddenly lifted her finger to the sky with a smile. She “wondered if he’d find her here”, she said. He did. You may wonder if this was commonplace for her. Was there a history of hearing voices? Did she communicate with deceased loved ones before? The answer is no. Mom and Dad lived their days together on the farm where he was born almost 96 years prior. Their life was spent in daily prayer, tilling the earth, and raising five wonderful children—one of which I am lucky enough to continue the legacy of photos with my head resting lovingly on his shoulder. I’ve heard it said that communicating after you’ve passed is not easy. I suspect it might be proportionately easier for those whose lives were spent honoring their creator in thought, word, and deed. Mom is the only one I know who literally wore out one of her rosaries. I know because she asked me to try to salvage it. It had literally fallen apart. Whenever I had the honor of watching mom say her rosary it would bring tears to my eyes. It was humbling to witness her love and devotion as she kissed her prayer cards and fingered the beads of her rosary. A few weeks ago, mom expressed concern that she “no longer remembered all the words to the rosary”. It really bothered her. Shortly after that visit, I was listening to someone explain how we learn things. She said that when we learn something new, we learn the correct words and the correct labels. Over time, we begin to understand and embody the lesson. We no longer need the words and the labels. She ended by saying, “where can I find the one who has forgotten the words so I can learn from them.” That someone for us was mom. Mom lived her rosary. To me, she was a living saint. As her vision dimmed and her hearing worsened, she found comfort in the feel of the rosary beads in her hands, and the impression of the cross on her lips. As worried as she was at having forgotten the words to the prayers, she still recited the rosary strongly out loud at Easter from memory, with heart–Still humbling all who had the honor of watching and listening. Since Easter, there hasn’t been a Hail Mary I’ve said that I haven’t cried. Every Hail Mary I prayed seemed a poor imitation of mom’s example. I recite, but she embodied. It seemed that as her life was winding down, there was an unspoken request to continue her legacy. She has been our foundation, our strength. Thank you mom. Our matriarch has passed and we all feel the loss. Five years ago my husband and I visited Poland—the homeland of our ancestors. I was having some issues with my left hip prior, but the pain was off the charts when we landed. The pain in my left hip wouldn’t allow me to walk more than half a block at a time without doing a “last resort” lunge wherever I could to alleviate the pain a little so I could walk another half a block. We had not rented a car so travel by foot was our only option within the various cities we were visiting. We went back to Poland this past June. This time we visited family! We stayed on the farm my dad was born on in a 400-resident village in south-central Poland. My cousin, Henryka, her husband and two daughters currently live there. It was a deeply meaningful trip of a lifetime. My cousin’s daughter, Anita, found us on Facebook in 2009. Since then, we have been in touch constantly. Her family’s connection with us and her visit here last year started the healing process of our extended families. Our visit back to Poland this year continued to “make right” the broken family relations. Anita tells me that during WWII, my dad’s mom and younger siblings would hide in the fields for days when they knew the Germans were coming. Upon returning to the farm, the German tank tracks were visible near their home, some chickens missing, the house disheveled. When Anita recently took us for a walk in a nearby forest that surely my dad had frequented with his brother and sisters, the smoothed out hollows in the earth where the Polish soldiers and villagers would hide from the Germans were still apparent this many years later. It gave me an eerie, surreal feeling to walk through the forest. On the one hand my dad probably spent some wonderful hours playing within the forest area; but on the other hand, the energy of soldiers in wait and in fear lingered. Back in the early 60’s my dad and mom sponsored his sister, Stanislawa, her husband, Henryk, and their three children—Maria, Krystyna, and Henryka—to come live here in America. After a huge falling out, my dad’s sister and family moved back to Poland. The details as given to me, a very small child, were sketchy. Between the pain of being taken from his family home during WWII and then losing connection to his family a second time with the falling out years later, I’m thinking there was definitely some ancestral healing needed in my dad’s immediate family. But anyone who knows Poland’s history—(woah!..literally, as I typed the previous phrase and Googled the “history of Poland” to research the dates Poland was not even a country on the map, our electricity went out in the house for perhaps 30 seconds. Insert Twilight Zone music here. I’ve had my own experiences with electricity and communication from those that have passed, but that’s for another blog. Communicating through electricity is apparently a venue of choice for those that have passed: “They also work through electricity – turning TVs and radios on and off, affecting lights, doorbells, phones. They seem to be able to manipulate energy – most likely because they’re energy!”. “Hello!” to my Polish ancestors!) As I was saying, anyone who knows Poland’s history knows Poland’s borders have changed numerous times. Perhaps visiting Poland without connecting with family five years ago stopped my hip from moving forward with ease on our trip. Perhaps my ancestral homeland was “holding on” to my every step insisting I do more than just visit the tourist stops. Who can say? (Read about the chakra connection in the Chakrascope section below!) As we planned a return visit back to Poland five years later, it was more than a little on my mind. I didn’t want a repeat performance! But perhaps this trip with the sole purpose of meaningful connection to family would help shift the energy of unexpressed grief. At least that was my hope. Karma is defined as “The total effect of a person’s actions and conduct during the successive phases of the person’s existence, regarded as determining the person’s destiny.” And another: “the cosmic principle of rewards and punishments for the acts performed in a previous incarnation.” If you look at karma in the light of our ancestral heritage, my bracelet was working on releasing any fearful and doubtful karma from my ancestors. I’d witnessed a friend’s karma “complete” its journey quickly, falling off within a few days. So I expected my karmic “lesson” to be, at the most, perhaps a week or two. Why I thought I could estimate timing on karma is humorous in hindsight. Each lesson is personal, as is the timing. As we approached the timing for our return trip to Poland, the karma bracelet still had not fallen off. I started to wonder if perhaps this once-in-a-lifetime trip to the farm my Dad was born on was to “complete” any unresolved karmic energies surrounding inner strength and courage. The courage and inner strength it took for all Poles to rise above their violent history—let alone my parents—and to hold onto their Polish heritage under threat of death was not something I dwelled upon as a child of Polish immigrants who had been prisoners of war. My parents shared no bitterness for having had ten years of their lives stolen with the added humility of being held prisoners on farms and in war camps, their families ripped apart. Both of my parents were prisoners of war on German farms. My mom was auctioned off to the highest bidding German farmer. She never, not once, discussed her time as a prisoner on that farm. I’m certain it wasn’t something she cared to remember and least of all share with her children. My parents and others like them buried their despair and their grief and moved on to a new life in the U.S. This is a common theme among WWII immigrants to the U.S. Their children learned to ask no questions. You were not to touch the sleeping dragon. I was an adult before the reality of my history truly hit me: “My parents were prisoners of war on German farms, met in a war camp, got married in the war camp, and had two kids in that war camp.” And I was a yoga teacher in my 50’s studying the effects of Post Traumatic Stress Disorder (PTSD) before I finally deduced that my parents weren’t just born with short fuses and erratic temperaments. Those are classic signs of PTSD. I was told our recent visit to Poland was an “event” for this quaint village. When we would walk down the road, neighbors would step out onto the road to peak at us as we walked away. One cousin remarked as she met me for the first time: “It is impossible.” She was referring to my return to my dad’s birthplace village. Another had just lost her last sister and expressed gratitude for having met me and knowing she was not alone. Each and every one of them touched my heart and will live on there. I will hold them close as I know my dad did in his memories. I couldn’t help but think about my parent’s decision not to remain in war-torn Poland; to move on to another land with two small children and start a new life. Now there was some inner strength and courage! I felt lost simply not knowing the language fluently and I had a fluent bilingual relative accompanying me everywhere! My dad tried to take lessons to learn English here in the U.S. early on but holding down two to three jobs at a time got in the way of his studies and he had to abort the lessons. My mom learned English all on her own, creating some of her own words and phrases along the way like “meat-lunch” for “lunchmeat” and things at an angle were “on an ick”*. She was my dad’s bookkeeper (he had his own ceramic tile, linoleum, slate business for close to 30 years) and took great pride in writing the checks and other business papers in perfect English after much trial and error. I know she felt self-conscious her whole life about the mastery of her second language. They both mastered the English language brilliantly, in my humble opinion. Marie Curie, Pope John Paull II, Copernicus, Chopin, and I might add, Chopin’s first cousin, Wladimir Krzyzanowski (recognize the last name?) to name a few. (*Side story here: It was last year sometime in a conversation with my second oldest sister, Barb, who is nine years older than me, that the phrase “on an ick” was used by my sister. I started to chuckle and she asked why. So I commented that “ick” was a sweet “mom-ism”—a made-up word from mom. There was a long pause, and she said “Are you serious? That’s not a word? I’ve been using that word my whole life!” –a more humorous example of an ancestor’s struggle with learning a new language in a new land. In Zakopane, as I walked among the Tatra Mountains my dad had often spoken so fondly of, I sent a silent message off to my dad’s spirit: “I am here, dad; and it’s as beautiful as you always said it was. I am here and I am home.” By the time we were in Zakopane, it was a little more than half-way through our trip. And after hiking 18 kilometers (a little over 11 miles) the first day—half of that all uphill—I knew my hip issues from five years prior were, thankfully, not going to reoccur! Of course, my husband and I also continued doing daily yoga throughout the trip each morning as well! Let’s hear it for the healing powers of yoga! As we were waiting to catch the bus out of Zakopane back toward Krakow, I suddenly noticed my karma bracelet was gone! It fell off somewhere in Zakopane! “Wear your bracelet to dissolve away any fearful or doubtful karma and give light to your inner strength. Confidence is the key to manifesting anything you desire.” I have to say having lost the bracelet in Poland, and particularly in the midst of the Tatra Mountains, must have made my mom and dad smile. It was a sweet feeling to have left a little part of me there. Dwelling on my parent’s inner strength and courage, as well as the inner strength and courage of all Poles, undoubtedly “gave light to” my own inner strength and I can’t thank them enough for that gift. I’ve read that ancestral healing allows you to make peace within your family going back many generations. Some say seven generations forward and backward. If my trip to Poland has done that for those that came before me and those that follow, for this I am truly grateful. If it has cleared the path for my own life’s mission, well that would just be the icing on the cake now wouldn’t it? How about you? What patterns, legacies, values, attitudes, key events, connections, struggles, triumphs and disappointments have been passed on from your ancestors? What impact have your ancestors had upon your present life? How will you embody their lessons and what will you pass on to those who come after? Are you disconnected from your immediate family? Only you can make the journey to complete yourself. There’s no such thing as a lost soul. I know where they are, and everyone makes it home.